BSH Oil Catch can for 2002-2006 R53 MINI Cooper S, and 2005-2008 R52 Cooper S Cabrio. BSH takes their oil catch cans seriously. Externally all cans are welded together to avoid the all too common leaking issues bolt together setups have. 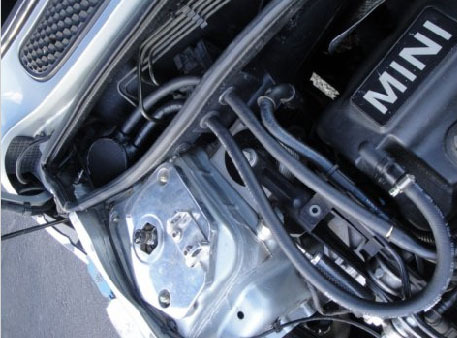 Internally better than the competition by incorporating mesh baffling to slow down oil vapors so they cool and condense inside the oil catch can instead of your charge piping/engine. All connections are made with push lock fittings and hose to limit the use of hose clamps that would otherwise clutter up the bay. Integrated drain fittings into the base of the catch can makes maintenance a breeze. All of the BSH oil catch can systems are designed to be completely reversible and mate up with all factory pcv connections utilizing vehicle specific billet connectors. 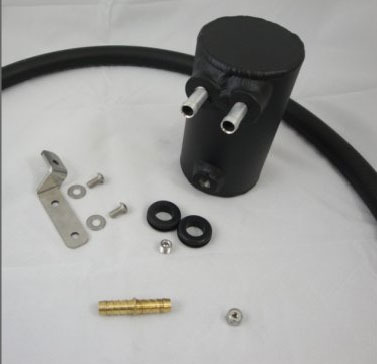 The R53 oil catch can kit ships complete with a laser cut stainless steel bracket for direct mounting to an easy to access bolt in the engine compartment.